Owyhee Flower Jasper from Malheur County, Eastern Oregon is another one of the many picture jaspers from the Owyhee Mountains area. This material was mined toward the southern end of the Owyhee reservoir near where Morrisonite was mined. Lizard Creek Jasper Replacement Petrified Wood is very similar to the Marston Ranch Jasper Replacement Petrified Wood a.k.a. Christmas Tree Jasper and the Hampton Butte Jaspers and Jasper replacement Petrified Wood (think Hampton Butte in the 50's and 60's, not the slim pickins you see today). Lizard Creek Jasper is hard and creamy and the good material (which is the majority) will take an AMAZING POLISH! 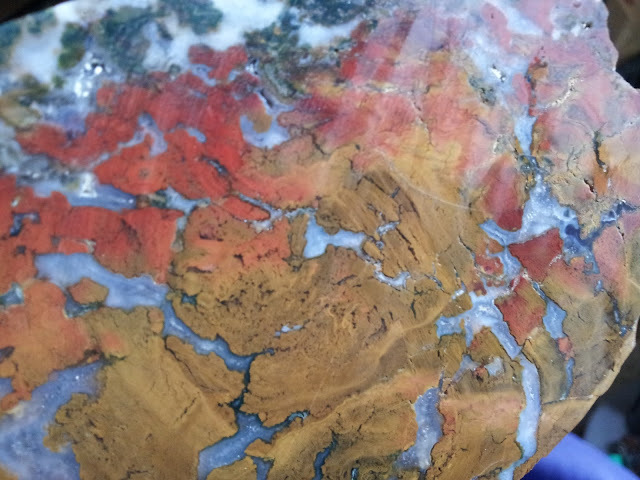 Most pieces have agate veins running through the piece and unusual patterns from brecciation to orbs to fantastic swirls in a rainbow of colors! We are almost always shocked to see what pattern will be produced on the slab saw! Tonight, all I could do is sit there and grin while I watched HUGE waves today wash the sand away. We've had an abundance of sand this year since we had a weak storm season last year and the agate hunting has been sparse.... I can't WAIT for storm season! 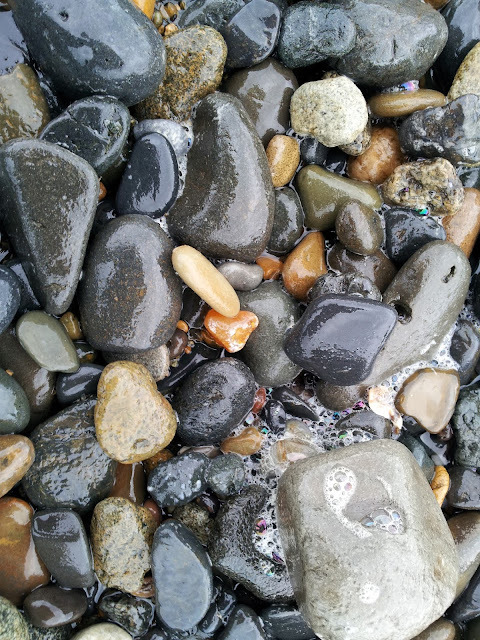 The best spots to look for agates right now in Lincoln City are at the mouth of the Siletz bay (park at the the turnaround on 51st) and at Fogarty Creek State Wayside. Conditions change daily, so be sure to stop in to Rock Your World, 1423 NW Hwy 101 in Lincoln City and we'll tell you exactly what to look for and where to find Oregon beach agates. 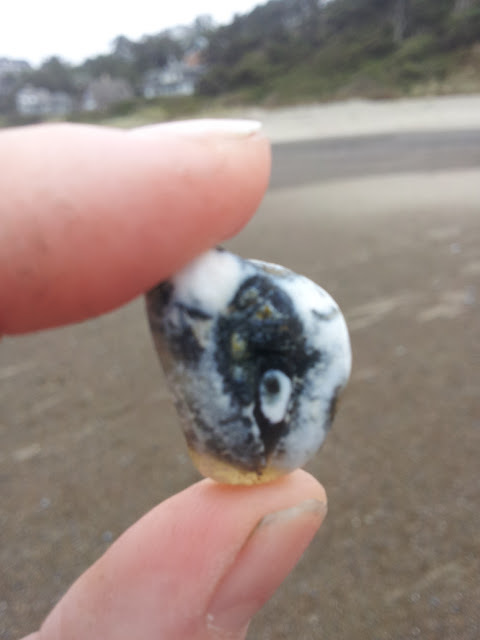 Be sure to friend us on Facebook http://www.facebook.com/rockyourworldgallery for updates on beachcombing conditions and photos of finds from the beach! Haystack Butte Jasper also referred to as Jellybean Jasper, from Eastern Oregon, is a hard jasper which takes a great polish. You can find Haystack Butte Jasper to the West of the Owyhee Reservoir, in Malheur County, Oregon on a hillside adjacent to the butte itself. The road to Haystack Butte is pure hell and can high center even the best 4x4 vehicle. Proceed with caution if you go after this elusive gem! 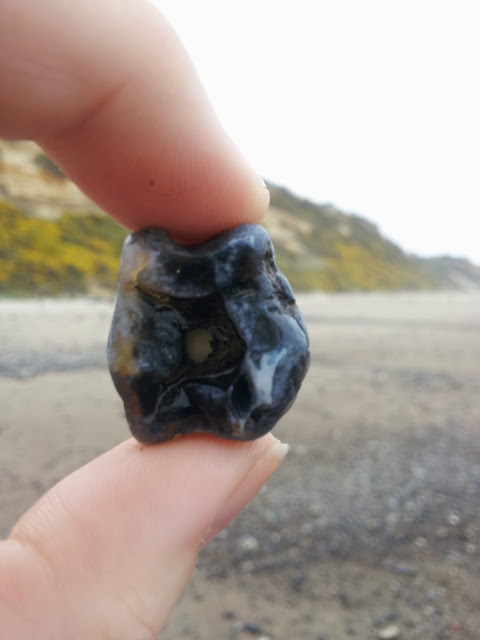 The blue-black beach agate is a rare find while hunting the Oregon Coast for beach agates. The blue-black variety are primarily found in Lincoln County Oregon. 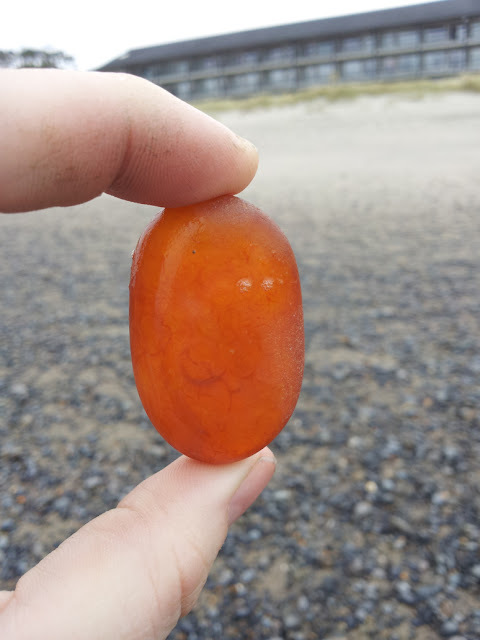 This gorgeous orange carnelian beach agate was found in Lincoln City, Oregon by one of the main beach access points near the D River. Stop in to Rock Your World and find out where you can find cool rocks in Oregon! We're happy to help you! Check out our Facebook page where we go out and show you the best places to find cool rocks in Lincoln County Oregon including Lincoln City, Newport, Waldport and Yachats!